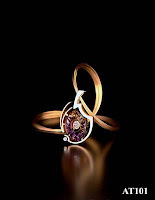 For the Love of Jewels...: Gordon Aatlo: Stunning Gemstone Swirls and Orbits! Gordon Aatlo: Stunning Gemstone Swirls and Orbits! I first learned about Gordon Aatlo through a request I put out on LinkedIn seeking “the best-of-the-best” jewelry designers. Numerous wonderful designers came forward (some to be included in this blog down the line), but Gordon Aatlo's work was so clearly outstanding! Born in Minnesota, Gordon moved to San Francisco at a young age. With his uncle as jeweler to the King of Norway and his father an accomplished bench jeweler, Gordon followed in their footsteps and has enjoyed a lifelong career as a designer, producing all of his own work himself, from concept to finished piece. Gordon debuted several new pieces at the AGTV Tucson show including his Orbit and Swirl Rings which are published on this blog for the first time. 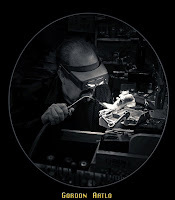 Gordon’s assistant, Christine, also mentioned that his work was featured during an ACTV meeting of the National Association of Jewelry Appraisers where they noted that they were putting a different appraisal value on work actually hand made by designers. It is fascinating to interview a person such as you who has made a lifelong success as a jewelry designer/creator; still with what appears to be a passion for the craft. What do you most enjoy about this career choice? There are many things I enjoy about my career choice! First, and most important is, I look forward to going into the studio each day, developing new designs that I like. I have the freedom to pursue and experiment with no outside influences or expectations. The other aspect that I enjoy is the people I meet, gemstone artists, suppliers, and clients, who enjoy and appreciate fine jewelry and gemstones. You write on your website so eloquently about the time early in your apprenticeship when your skills started to come together and the work began to flow...how is it that you so clearly remember that period and what do you think triggered that "ah ha" moment? I clearly remember that period because I had worked so hard, struggled really, for over a year and I had my doubts many times that my work would never progress. I can’t say that there was one moment, it was more of a gradual progression of improvement in both technical and design skills, until the one day I had a finished piece in my hand that I was satisfied with. Gradually, with every new project, I came to have more confidence and an excitement for the possibilities of what I could accomplish. I continue to have “ah-ha” moments! If I have to choose one style that encompasses a description of my designs, I would have to say modern. I feel my style is wide open as I’m not structured or rigid with a design that it can’t be changed. I chose modern over contemporary because I think contemporary describes more of a style that is of the moment and I think my designs stand the test of time and cannot be defined to an era. My styles and designs are subject to where the gemstone and idea are leading me to the moment I start to develop the design. When I first started showing my work in Tucson, my assistant would be asked “How many designers do you represent?” That is how varied my styles are. I might create a series of pieces, such as the Swirl Pendants, no two pieces are ever the same? Tell us about the importance of gemstones in your pieces and how you work with gemstone artists? Gemstones are the centerpiece of each design and for me, I am attracted to the gemstone first, and then develop the design. The color, cut, shape, size and quality all play a part in what design will best showcase the gem to its best advantage. The shape and size will naturally dictate some part of the design: curved lines for round stones, straight lines for trillion or cushion shaped. The gemstone color also will dictate what metal I use. Sometimes I will use both gold and platinum and I like to set cooler colors, like Tanzanite in platinum or white gold, but not always. Artistic gemstones are the biggest challenge of all, finding the perfect balance between showcasing the work of art and creating an interesting design to showcase the gem. Arthur Lee Anderson’s work is so precise and the optics are fascinating. His Webbed Halo cuts and Blossom cuts are some of my favorite to work with. Glenn Lehrer “Torus Ring” gems are challenging, whether they are round or rectangular, because of the hole in the center. Sometimes I fill the hole with a diamond set in a bezel and there have been pieces where I set another Torus Ring inside of the Torus Ring. Michael Dyber’s work is fantastic and is so is the work of Larry Woods and Daylan Hargrave. Berndt Munsteiner’s work has sometimes been my biggest challenge. I am intrigued by the gem, the cut, the size, but the idea isn’t there. I had a pair of Ametrine’s he cut, large and flat, and not matched for size or shape. I had done many designs for Munsteiner’s single gems, but these demanded something special. They sat in the safe for years until one Sunday, while I was reading the newspaper, the idea struck. I went to my desk and in five minutes I had my idea sketched. The finished pieces were all I had hoped they would be. I do collaborate with the artists when I have an idea and they will design a gem for me, but most of the time I see what they’ve done and get inspiration from their beautiful and unusual work. I love the work of all of the artists and it’s hard to pass up a beautiful gem and often I don’t! I have many gems sitting in the safe and I’m waiting for that great idea to strike. You have a section on your website you call "Gordon's Favorites". What becomes a favorite for you? There are many reason’s a piece becomes a favorite. It can be because from start to finish how the work flowed, how it came together, from finding the gem and the excitement I have while developing the design and even how the metal seemed to lend itself to the design. Another part of what makes it a favorite is the response from people as they see the piece and enjoy it as much as I do. As I say on the website, I am happy with everything I produce and it’s hard to pick favorites! Tell us about your new designs which you premiered at the Tucson show? For Tucson this year, I premiered new designs in rings, pendants and bracelets, and also continued designs in the current Swirl and Petal Pendant series that have been popular with my clients. The new rings are highlighted by one Tsavorite Garnet and diamond ring which received lots of attention for its design. Some people thought it reminded them of an amusement park ride, some the solar system! We’ve taken a consensus and have decided to call it “Orbit” Other rings premiered are in the same style and feature Pink Sapphires, Spessartite Garnets and Blue Sapphires. They are flatter than the Orbit and easier to wear. New pendant designs included Paraiba Tourmaline’s cut by Glenn Lehrer; one set in yellow gold and one set in platinum. Both designs were very well received. I featured versions of my AGTA Spectrum Award winning design featuring new work by Arthur Lee Anderson and his new cut, the Spired Webbed Halo cuts in Citrine. Another pendant shown this year is a continuation of the Deco inspired pieces in gold, platinum and Lapis. Because of the response, I am working on new pieces in this series in pendants, rings and cuffs. New bracelets this year included a free form yellow gold multi-colored Sapphire and Diamond cuff with matching earrings and a fabulous Pearl cuff with large, natural colored pearls ranging in color in white, pink, peach and lavender tones, diamonds and multi-colored sapphires. Another cuff, more streamlined and structured, showcasing another Arthur Lee Anderson Amethyst, was premiered. As the designs are all one of a kind, we have a lot of visitors to the booth that are always interested to see what we’ve brought along. How was the show for you and what did you perceive to be the biggest change with this economy factored in? What was the overall theme you heard from other jewelers? We did consider the current economic situation months before the show and that did play a part in what pieces were developed to premiere at the show. I followed my instincts and created pieces I thought were right and know my clients expect to see from me. Although attendance was down, we were quite pleased to see that most buyers were focusing not only on the design, but the quality of the work and the value. Great designs, big looks and quality of workmanship are what we offer and new customer’s are amazed how affordable my work is. In the AGTA section “Spectrum of Design” most of the designer’s I talked to expressed some surprise as to buyers being more interested in the higher end, unique pieces. With none of us really knowing what to expect and that comes with any show, most of us were pleasantly surprised. And I do think that has to do with buyers appreciating more and more they need to set themselves apart and offer their clients something different. As someone who has been successful through many years of good and bad economic times, what advice do you have for the rest of us? My first bit of advice is to be strong in your convictions and go forward with your ideas and appreciate your talent. We have to do whatever it takes, whether its longer hours or cutting back on expenses. It does get scary, but as artists it can be that way in good times too. There always seems to be something out there to get you through. Hang in there and have faith in your talent and yourself.